I have been working on another "Marie" cloth doll this past month. Here she is, my "Hamlet Marie". I call her that because I think that this version of her is the one that lived in her little Hamlet a couple miles from Versailles. There, she dresses more simply and may have even worn her hair down. The Hamlet itself is utterly charming, with cottage like abodes, a windmill, a stream and plenty of kitchen gardens....very romantic! 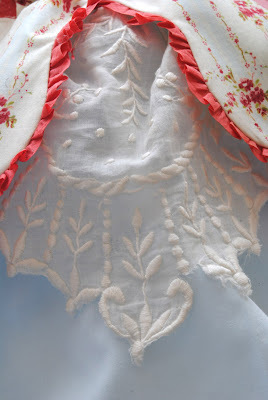 I used some beautiful quilting cottons, some vintage seam binding which I dyed, some silk, a piece of a very old doily for her apron and some vintage rhinestones. I am still learning about this process. I need more practice on doing the face, in fact, she definitely needs new lipstick. I enjoyed making her body and clothing very much, I just need more confidence with the face and hair. I figure practice makes perfect (or close anyways!) so I will make another one. I do love making the shoes! Thank you so much for stopping by today. I hope that you are having a great holiday. Tomorrow I will announce the winner of my giveaway from my last two posts. OMG, she is GORGEOUS!!! 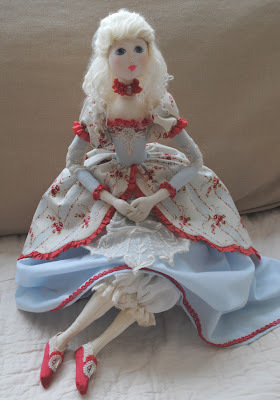 Another thing we have in common...I'm a doll collector and I "USED" to make dolls also! Mare is "Absolutely Gorgeous"!!! My Mom used to make bed dolls WAY BACK WHEN. I had one that she made that looked a bit like your Beauty here! I LOVED her and I LOVE yours!!! She's precious, Terri. I read a novel about her years ago. If you can believe the premise of the author, Marie was highly misunderstood and criticized. Because of her background...she simply was in no position to understand poverty....and they certainly didn't have today's libraries and schools to enlighten one! Anyway...you asked about my pouches on Etsy...Holly hasn't uploaded them yet. Keep watching! Soon! Thank you for looking! Oh Terri she is absolutely beautiful and I love the way you dressed her! She is so perfect and elegant, who would not love that sweet face. I can hardly wait to see what else you have planned for the new year!!! OMG!!! How beautiful isn't that doll!! What a work you've done!! Wonderful! Want to wish you a happy new year! I had to giggle when I got to the part about shoe making being the favorite part...I so agree...as I struggle to get the body parts on I keep thinking I cannot wait to make the shoes!!! Of course, you already know that I have chosen the material for my doll based on the shoe fabric...so I am thinking you so understand that. 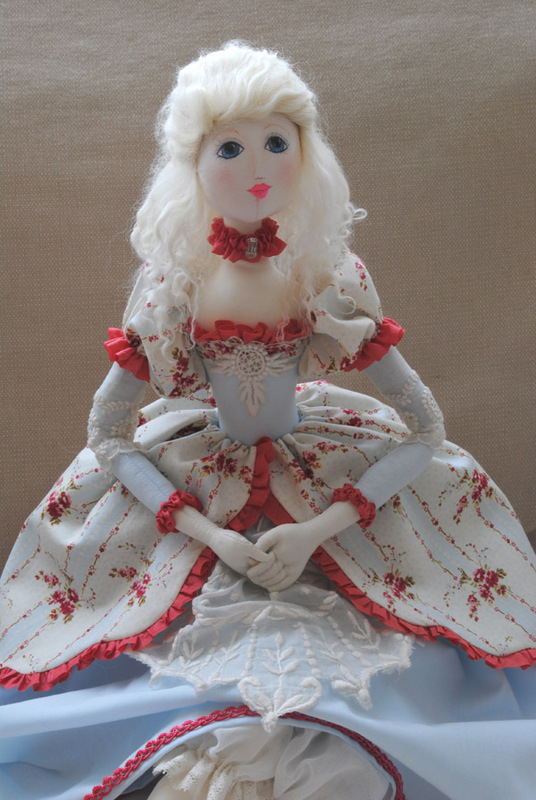 Your doll is very lovely and I agree with Lady Jane, you are being too critical. She is beautiful. Oh Terri, she's stunning, absolutely STUNNING!!! The fabrics you chose for her dress are so pretty, I love the colors. And the lace details and apron, are just perfect! She also has a very pretty face. I'm SO impressed with your beautiful work! What an absolute gorgeous doll! You do amazing work. Terri, your dolls are amazing! You have another winner!!!!! She is just gorgeous!!!! What a wonderful job you did! I love the shoes too, so sweet! 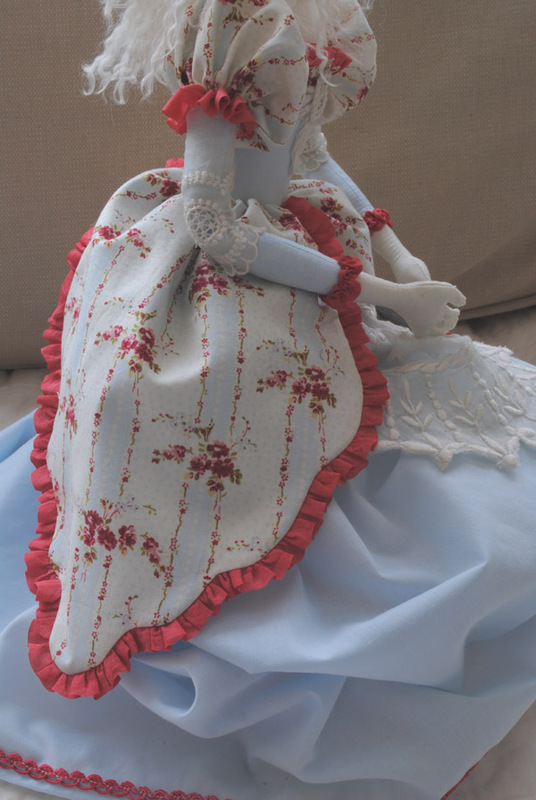 Beautiful job and you did exceptional on her hands, you should pop over and join the Cloth&Clay Dolls group! Happy New Year! Hi Terri...wow.super wow...she is beautiful..her dress is brilliant..love that doily..dazzling and gorgeous!! You rock..she is really special!!! THanks for sharing this magical spirit! Terri....you are your own critic! STOP....she's beautiful! Her heads just fine and your sewing is perfect!!! Mare's story is sweet and simple, like her. I love her little shoes, too! BRAVO! She's outstanding! Oh my goodness, the doll is gorgeous! I am not a doll collector, but your doll may change my ways. She is really a piece of art! Absolutely beautiful! Terri, what a beautiful doll!!! Oh, I don't know how you sew on such a small scale, but what an absolutely wonderful job! The fabric prints you used are utterly lovely; the hair, the shoes, everything...yes, even the face. I could go on and on, but I think you can guess how lovely I think it is. I'm looking forward to your giveaway announcement tomorrow...I'll be checking in. She is adorable! And those shoes are totally precious. 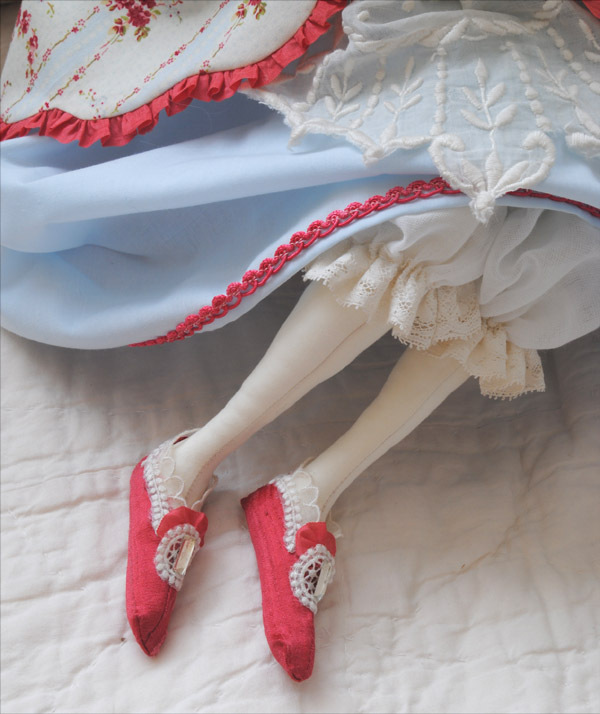 I love looking at all of the detail that you put into your dolls. She is so beautiful and so serene looking. And, the costuming is out of this world. I love her shoes and I love everything about her. Happy New Year. Thanks so much for your kind comments on my blog. TERRI!!!! YIKES, YIKES, TRIPLE YIKES! I LOVE HER! I LOVE HER SHOES!!!!! O.K., first of all, THANK YOU FOR VISITING OUR BLOG, Nowhere. We are silly grownups having so much fun. You are always welcome to come and get a chuckle. Secondly, dearest, do you just sell the shoes? Let me know...this is fabulous. I draw Marie Antoinette and I also plan on selling fabric through Spoonflower using my designs, but I need to set up my account. Oh, there is so much creativity out there! Ahhhh, she is so sweet, your Marie. Wanted to stop by to wish you a very happy New Year! Hugs galore! Precious doll Terri! Have a Happy and Healthy New Year!! A-M-A-Z-I-N-G! She is gorgeous! I don't know how much more perfect she can be; she certainly looks PERFECTLY BEAUTIFUL! She really is beyond gorgeous! Have a wonderful Hogmanay and happy arting in 2011! You are one talented and creative woman. She is delightful! Wanted to stop and wish you a Happy New Year. Can't wait to see what you create in 2011. Such a beautiful doll Teri. And so much detail, I this she is just gorgeous! She is just lovely...I hope one day to have the time/patience to create a cloth doll such as this...your detailing is superb and I think her face is lovely...I have long admired the artwork in your header and thought it reminiscent of doll artist Marina Bychkova style. Thank you for sharing this little lovely. OH my goodness, she is incredible. I love her little shoes, and I think her face is perfect. You make me want to make dolls again! Oh Terri, I absolutely love her shoes! Terri I am stunned by your talent! She is wonderful ....a real work of art. Ooooo Terri another wonderful creation, my gosh you are so talented! She is just beautiful. Is this your own design or did you buy the doll pattern from somewhere? I would love to know how to make one of these dolls, or perhaps you could guide me to a website to give some tips? I really enjoyed my visit here today, I will be back!